Images are a fundamental part of the online experience. They increase social sharing, make content easier to read, illustrate your subject, and they just look good. Have you ever needed to find a particular type of image?There are image search tools to help refine your search and save time scrolling through non-relevant pictures. Here’s a way to do it faster. Use advanced image search refinement. Let’s start with Google and Bing search tools and compare what we can do. As an example, let’s find an owl image. Let’s see what options we have. To use Google’s Image Search features, you have to notice the search tools button. Bing essentially has fast food restaurant sizes: small, medium, large, and extra large. They also offer a layout menu with square, wide, and tall. Google’s image size feature is exceptional, I like the fact that I can click “exactly…” and type in my preferred size. After I select an image size, I may want to specify an image color. This is useful if the owl image needs to match my blog’s color scheme. I can get transparent background images (useful if I want to put an image on top of a background without having to isolate the original image). I can also get images that are black and white, or full color. 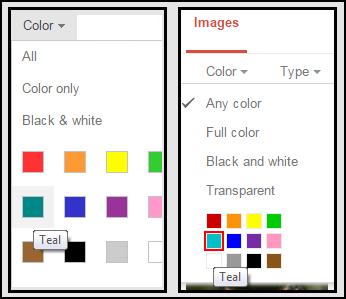 Check out the color filter options below, with Google on the right and Bing on the left. Now, we will do the same with image type. I will let you guess which one is which. Give up? The “Face Filter” option makes it seem like Google (right) has more to offer. However Bing has an extra menu where you can further specify your search. 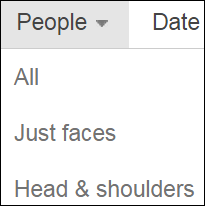 As an aside, some people don’t understand how Google uses facial recognition algorithms. A bit off topic but the link provides a succinct explanation. In the category of time, Google wins because they offer a custom date range filter. Let’s say that I want a picture of Barack Obama, and I only want one of him before his presidency. Using this filter, I can easily get to that result. I can also restrict my search to find a recent image. In addition to setting a time range, Google also provides Past 24 hours and Past week. Bing wins here because they offer license definitions in line with the Creative Commons agreement. When you find an image, you should go to the source. Make sure to determine the actual license since Bing makes no guarantees about the validity of its license parameters. Google also has a filter for usage rights, but it is quite different than Bing’s. These follow the Creative Commons agreement, like Bing. However the terminology may be somewhat confusing at first. The usage rights that Google refers to are: Using, Sharing, and Modifying. Either way, you are still encouraged to go to the source and verify if the image needs attribution (a statement of where you got the image). This filter removes sexually-explicit images and videos. You can lock this setting in the Google Search Settings menu in case you have kids. Bing defaults to moderate safe search, but you can change it to strict or turn it off entirely. For these features, we will use “WordPress Logo” as the search query. At the top of your results, see related search queries. When you scroll through your results, you will find a banner with search query refinement suggestions. Further down the page, you will see another group of suggestions, but these will be closer to your original search query than the first group of suggestions. Google doesn’t have an equivalent for Bing’s Related Search Queries, Refine Your Image Search, or Explore More Searches. This feature reminds me of Amazon. You know, where you get suggestions for things to buy. An example: People that bought a toothbrush also bought toothpaste. The same applies to images. People who searched for “WordPress logo” also searched for Drupal, Sharepoint, Youtube, RSS and so on. The heart logo enables you to add any image from Bing’s search results to your favorites group. You can then reference these “favorite” images. First, navigate to the Bing image search page and look for “See All Favorites” on the right side of the page below search query suggestions. When I click on “my favorite images” I can then select Trending to view: Popular people searches, Popular animal search, Popular nature search, and Popular wallpaper searches. In the view where you can add an image to your favorites, you have many other social features at your fingertips. 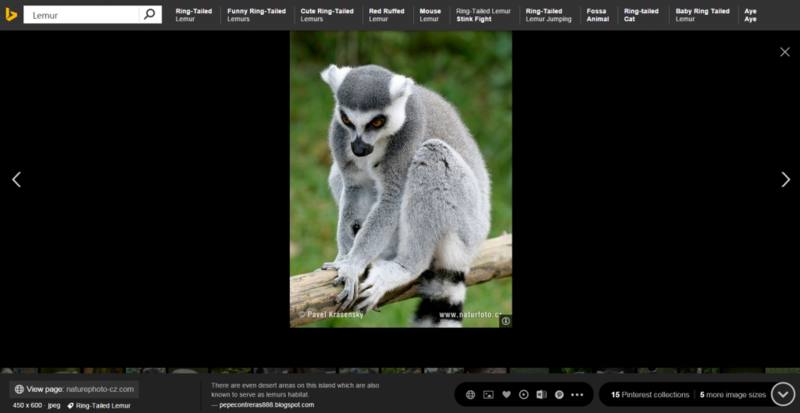 In the popular animal searches, I selected Lemur and then clicked on an image. Here is what I saw. The internet has many resources for your image needs and these are just two sources. As a digital marketer, you need to understand copyright law for the pictures you use. Additionally, you need to know how to find the right images for your needs, which may sometimes require a small investment. There are many sites that offer images as a paid service. By becoming aware of free sources, you can save quite a bit of money. Now, let’s get even more technical. Here is an even better tool for you. Let’s say you want to use multiple advanced parameters and don’t want to load images till you’re done. 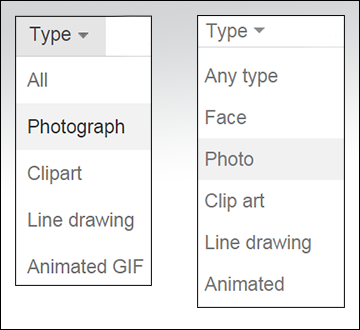 Save this link for google advanced image search because you can enter all of your desired attributes to get to the image you want right away. The Google Tools discussed above are all here, plus some more. Let’s say you want to find “ski slopes in Canada”. Using quotes requires that the search results have that exact combination of words in the content. The same can be applied to images. This requires the text to appear in the metadata. Exclude keywords from your results by adding a “-” symbol in front of a word in the search bar. If you are looking for “software or application or platform” you can type the “or” operator between words to expand your search. In the advanced section, google adds the Tall, Wide, Square, and Panoramic image type which wasn’t in the basic search tools. You can type in a site www.example.com or Top Level Domain such as .edu, .gov, or .org to restrict your search. It’s the equivalent of adding site:www.example.com or site:.edu to a search query. Limit your image search results to a specific region. This is quite useful if you want to find images from a specific country regarding a specific topic. It’s important to remember that Google is a search engine and that the images you find are all hosted on someone’s website. With this in mind, you can look at image search as another way to find websites. For example, I can search for “electric circuit” images and find websites all about electronics. In the advanced search section, I discussed some search operators. You can use these on regular search queries and there are many others that you can learn about on the Google’s Search Operators page. At the bottom of the advanced search page, you can learn about searching pages you have visited, and customizing your search settings. The internet has many resources for your image needs, and these are just two sources. IMPORTANT NOTE! As a digital marketer, you need to understand copyright law for the images you use. Additionally, you need to know how to find the right images for your needs, which may sometimes require a small investment. Thankfully, Google and Bing are free, for now. One of the main issues is that a webmaster can upload copyrighted work without a license and it can be indexed by google and bing. TinEye can search the web for instances of the image. The safe assumption is that most images are copyrighted. I like to use Pixabay because they have a section where they specify Public Domain image Licenses. Here is an example of one of their Public Domain images. In the comments below, please let us know where you like to source images, and anything else you would like to add to this article.